This unique card was copyrighted in 1906 by A.C.C. (Art Color Co., Philadelphia), and wonderfully drawn by Harris H. Brown (artist of Willie Green for the Philadelphia Record). There's a tiny "HHB" signature on the card near the edge of the border on the right-hand side. I ID'd him years ago when I saw other cards signed by the same artist, and noticed a similar signature on one of the sample Willie Green strips posted here on Stripper's Guide. 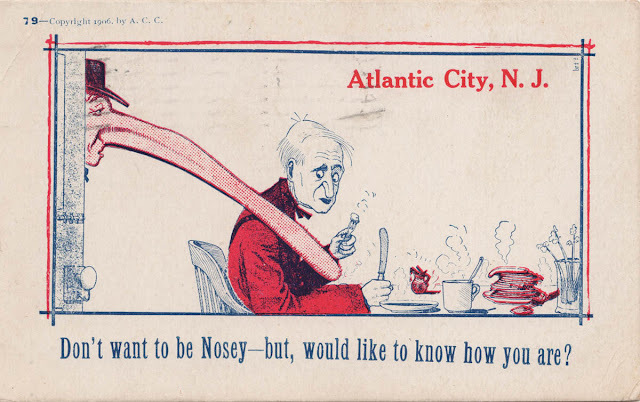 Judging by the "Atlantic City" text placed on the card, I'd say that this was sold with other comic cards with this same color scheme at the Boardwalk at Atlantic City, NJ.